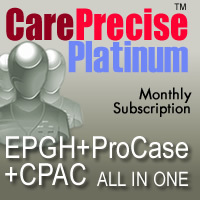 CarePrecise Platinum 1-year monthly subscription to the bundle that includes the CPAC and EPGH (Master Bundle) datasets, plus the CP ListMaker software to give you the power to build tightly targeted lists for direct mail, telemarketing, fax marketing and research work, and for properly casing name and address output. The Extended Professional, Group and Hospital (EPGH) dataset is an add-on to the CarePrecise Access Complete (CPAC) dataset product that adds further information about individual providers and hospitals. Professionals are linked to their practice groups and hospital affiliations. Extended data on professionals includes medical school, graduation year, primary specialty and a compact field of secondary specialties. Extended hospital data currently includes total Medicare claims.